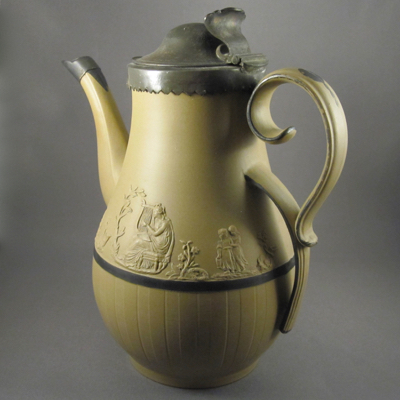 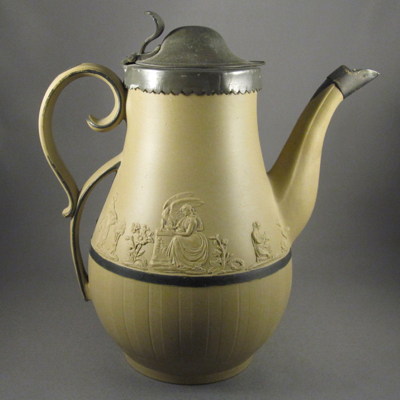 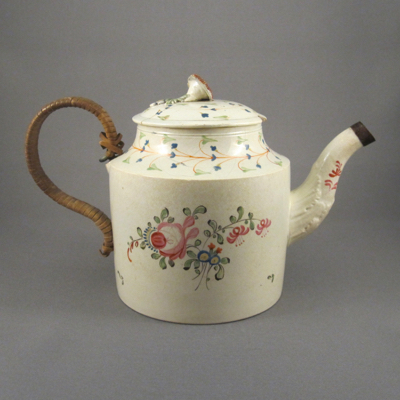 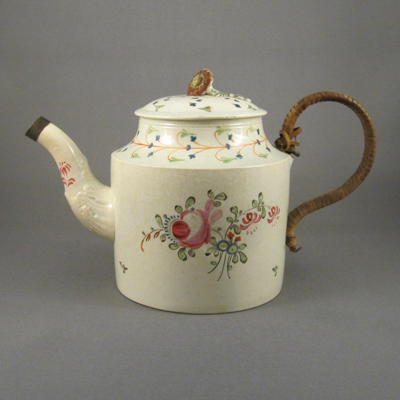 This impressive drabware coffee pot was made by Samuel Hollins in Stoke-on-Trent, England, c.1795-1800. 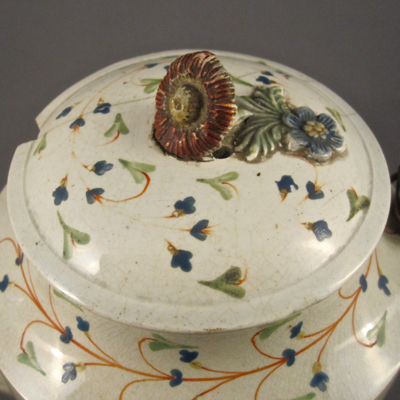 Made from unglazed dry bodied stoneware, it has sprigged decoration on the top portion, a ribbed lower portion, and silver lustre painted trim lines. 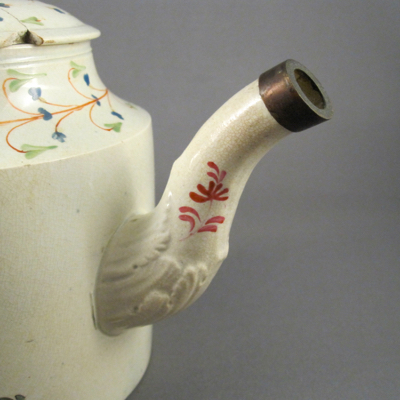 It measures 8.5 inches high and 7.75 inches wide from handle to spout. 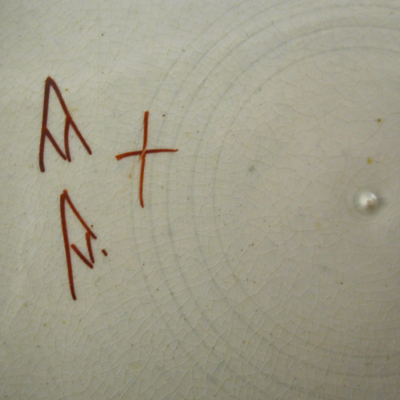 On the underside is the impressed mark S. HOLLINS. 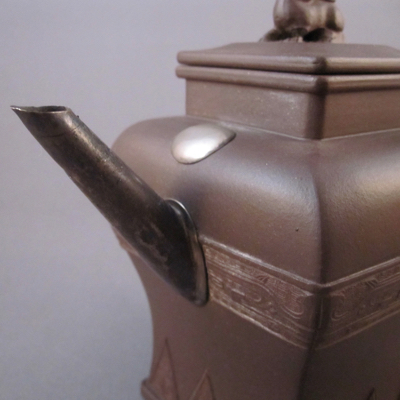 It appears that soon after the coffee pot was made, the tip of the spout broke off and the lid went missing. 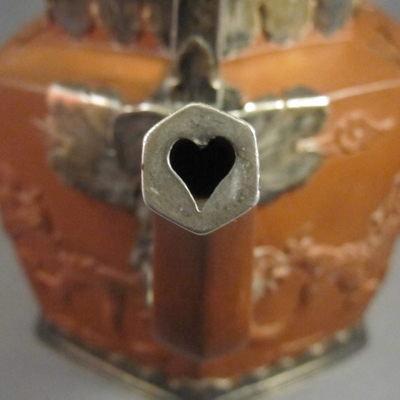 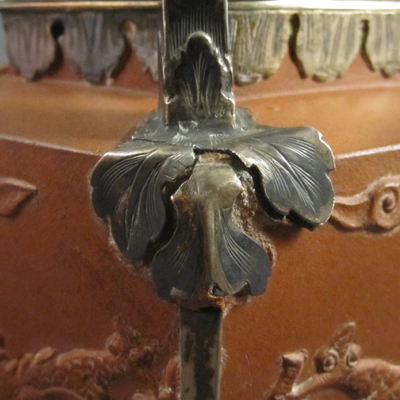 Luckily for the owner, a local tinsmith made a sturdy metal replacement lid, adding a hinge and a sawtooth edged collar. 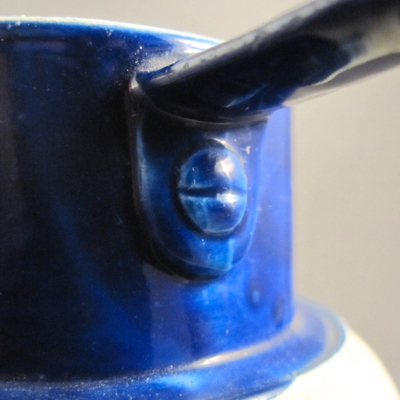 Although quite different in appearance, the new lid is more likely to remain on the pot, and the chance of another mishap his less likely. 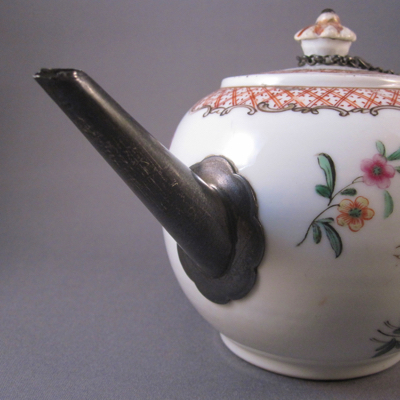 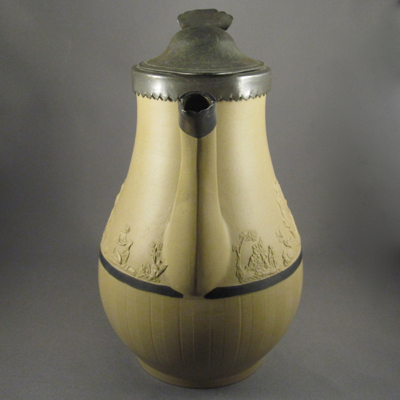 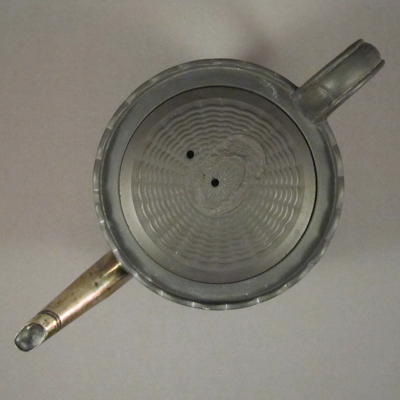 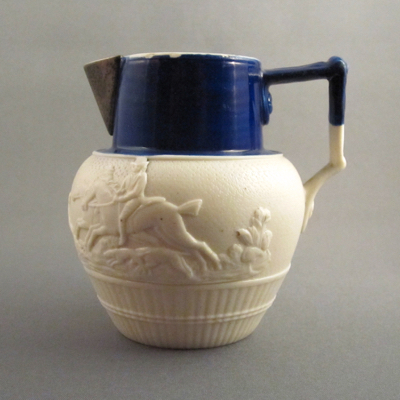 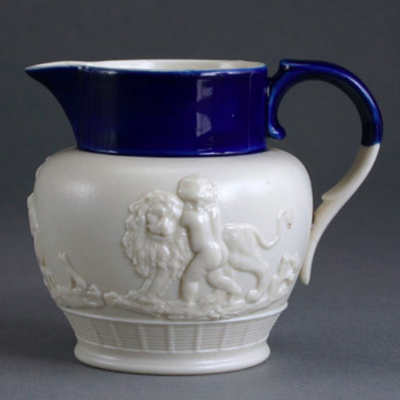 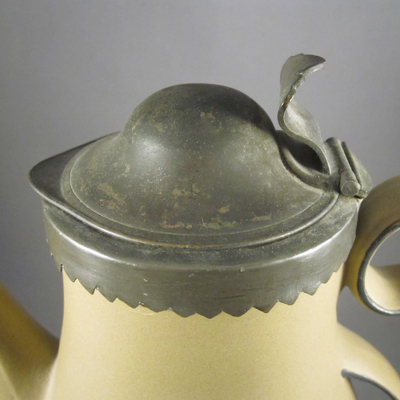 This one shows what the original spout and lid would have looked like on mine. 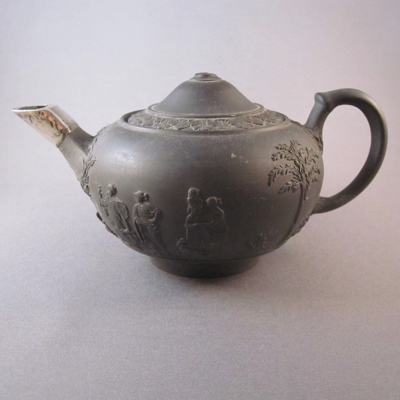 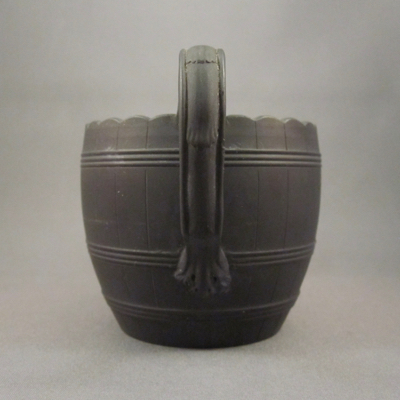 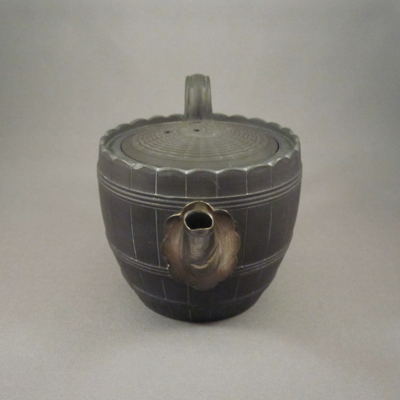 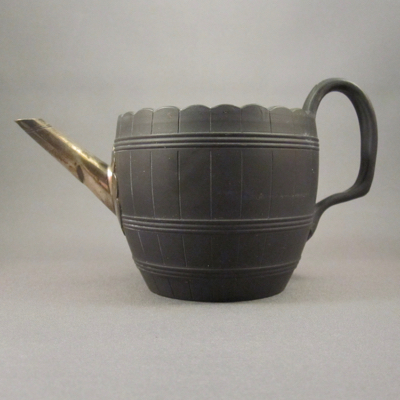 This basalt stoneware barrel-form teapot was made in England by Wedgwood, and in production from 1780 to 1790. 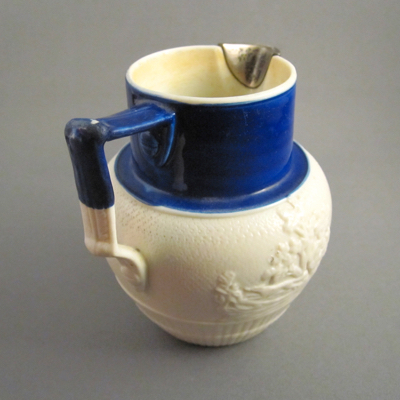 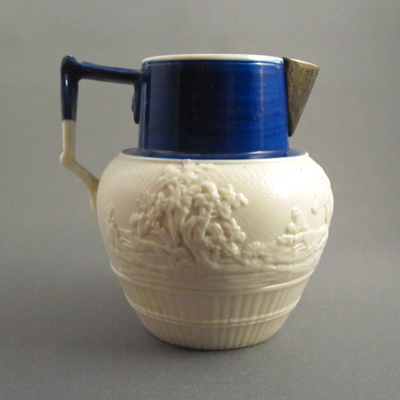 It measures 3.5 inches high and 6 inches wide from handle to spout. 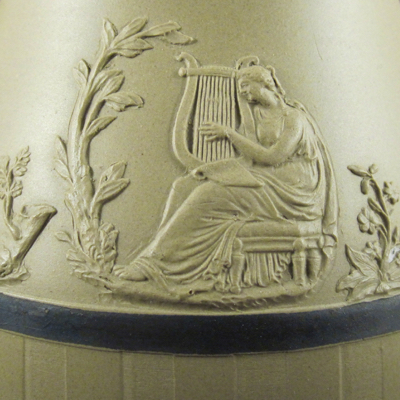 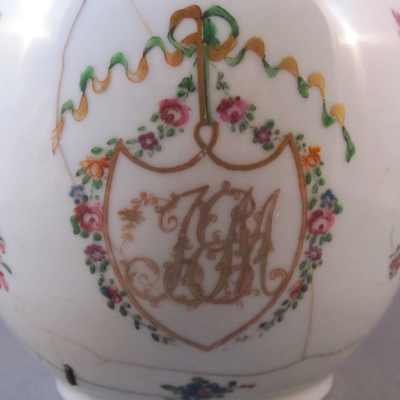 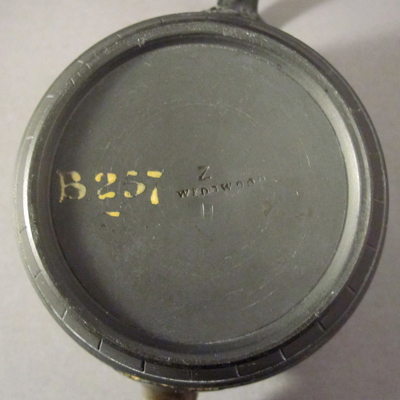 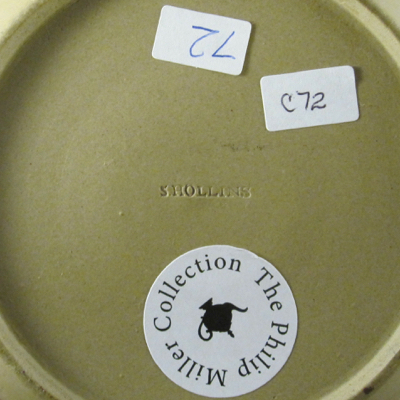 The underside has the impressed mark “WEDGWOOD, Z, 1x”, and “B257” is hand painted in gold on the underside of the teapot and its lid. 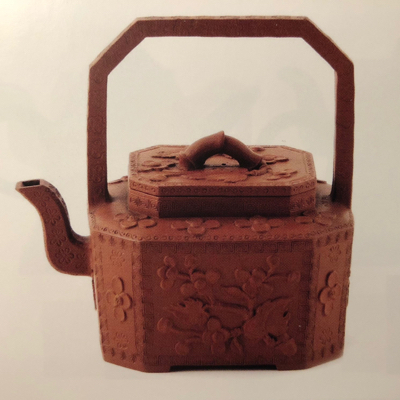 Sadly for some but happily for me, over 200 years ago this small teapot slipped from the hands of someone who must have cherished it and the spout broke off. 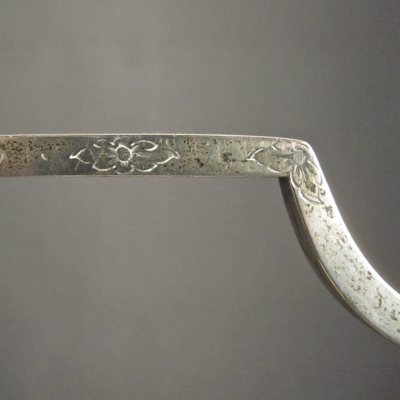 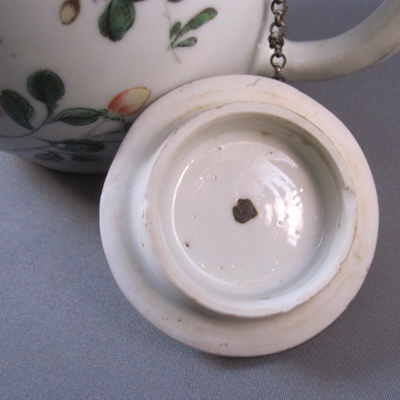 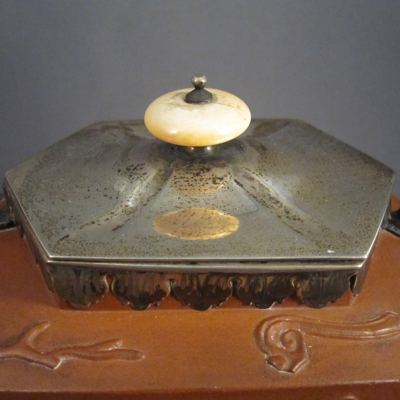 It was taken to a jeweler or tinker who replaced it with a silver spout on a scalloped plate. 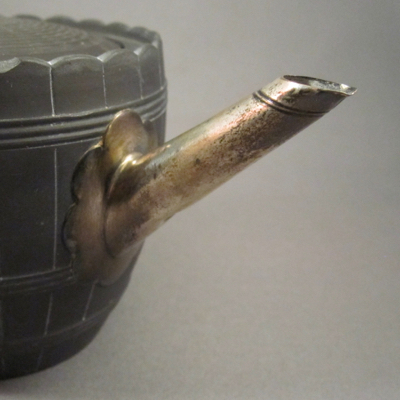 I have many examples of spouts with the same design, so I assume they were made in bulk by jewelers to have on hand, ready to be popped on to similarly damaged teapots. 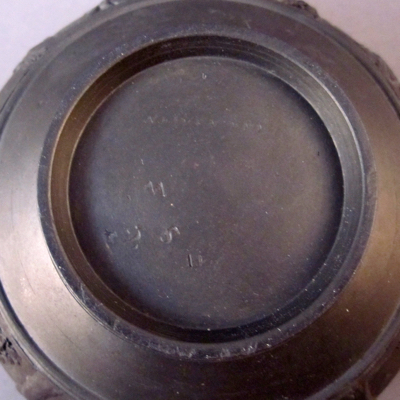 The lid’s knob broke off at a later date but was not replaced. 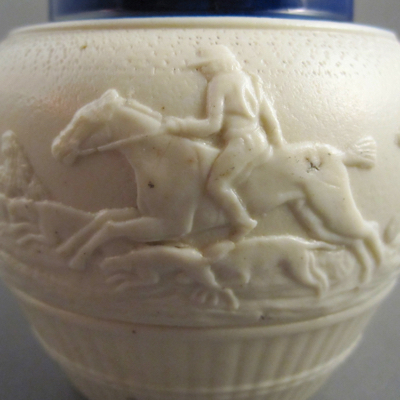 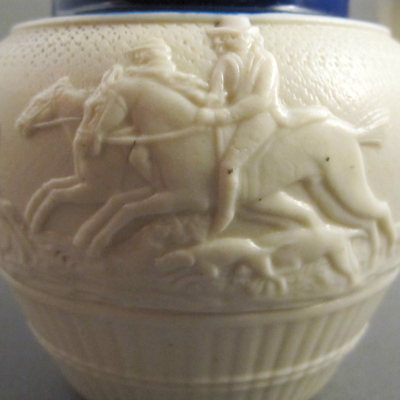 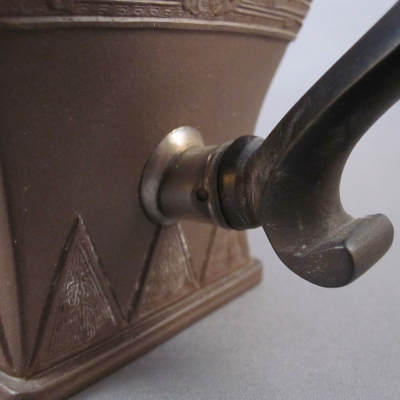 I am hoping one day to make my own replacement knob of the same design, perhaps in silver to match the spout. 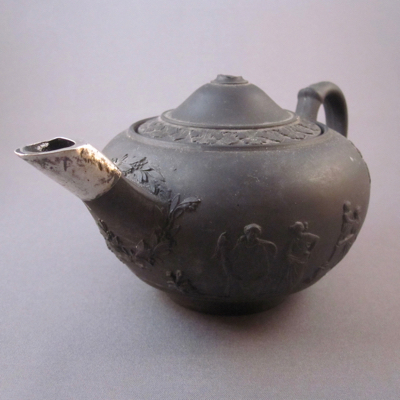 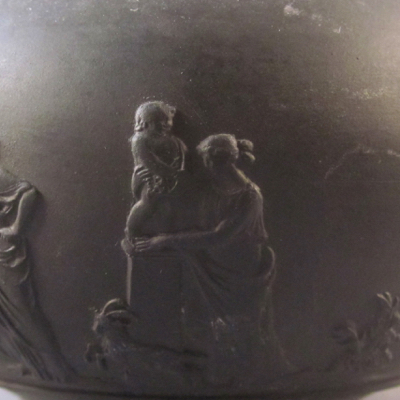 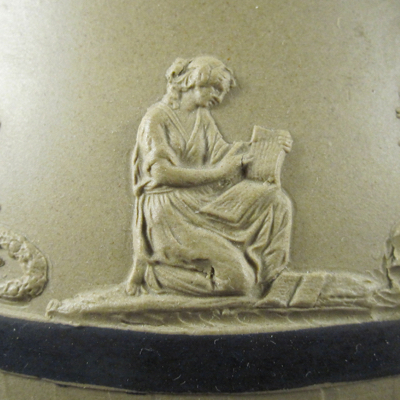 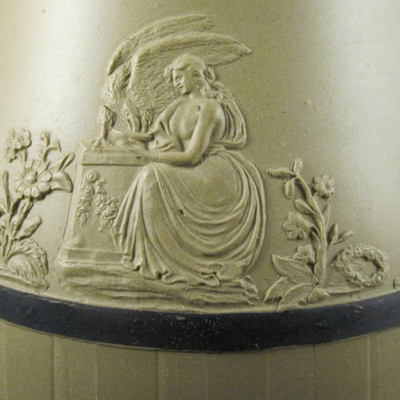 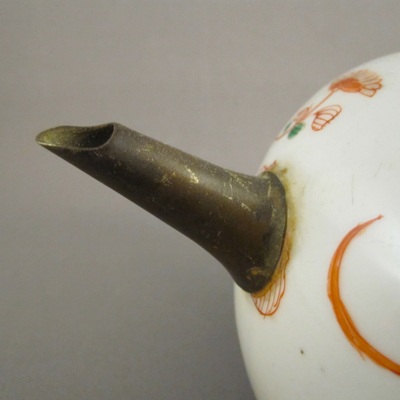 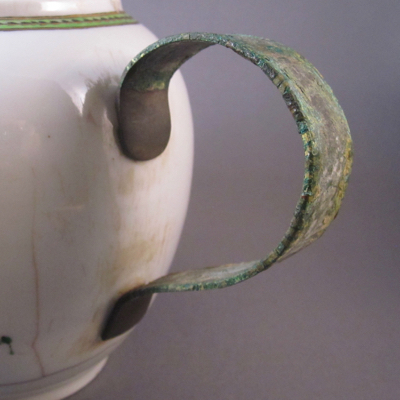 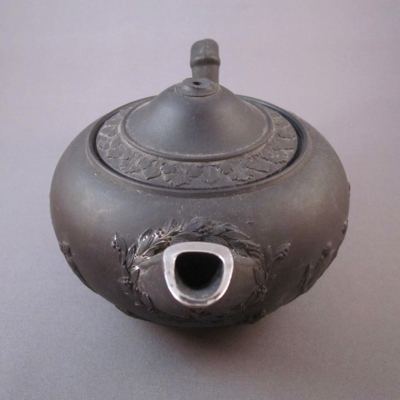 This undamaged teapot shows what the original spout and Sibyl-form knob looked like before they were damaged. 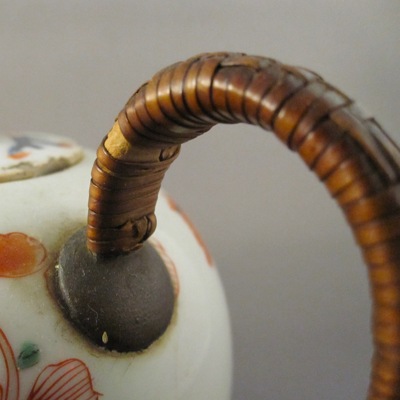 Photo from British Teapots & Tea Drinking by Robin Emmerson. 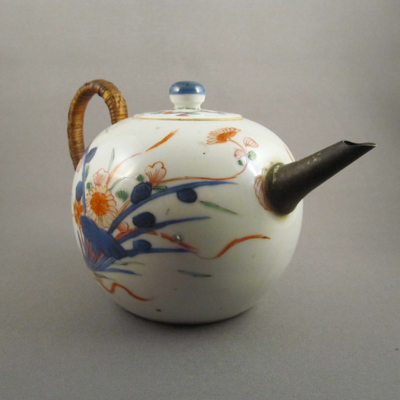 I love finding pieces with multiple repairs and this lovely soft paste pottery creamware teapot with pearlware glaze fits the bill nicely. 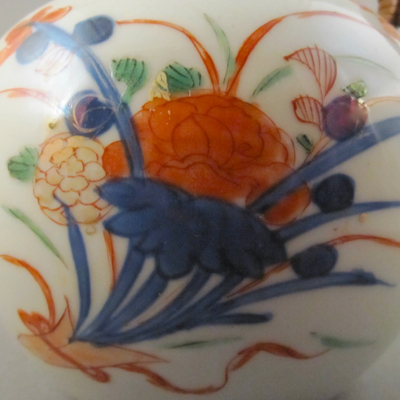 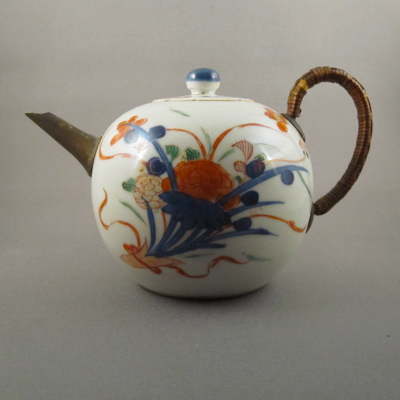 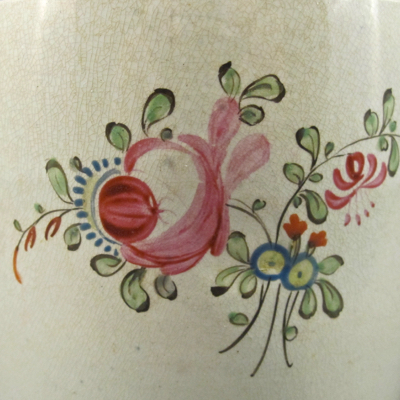 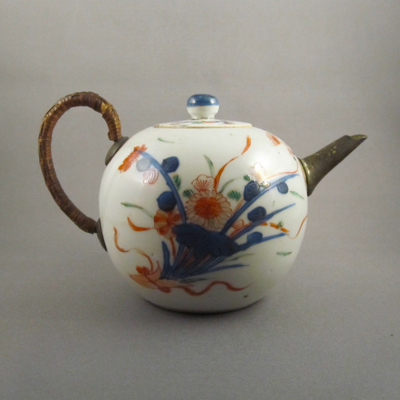 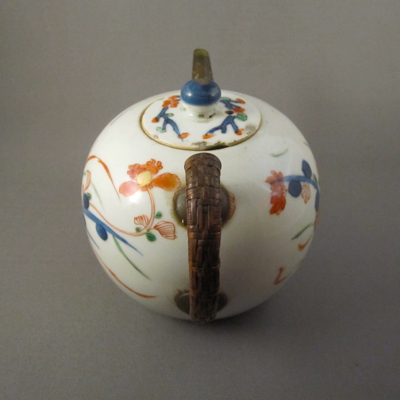 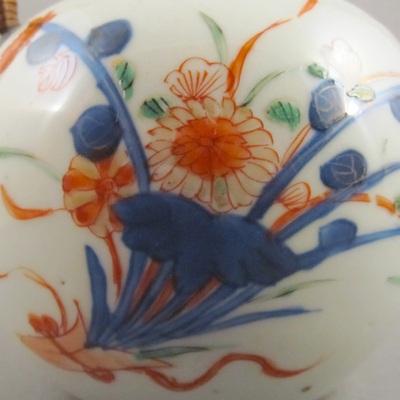 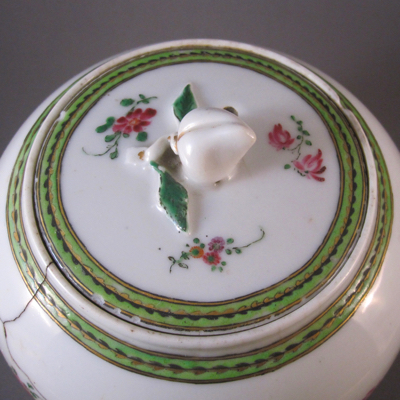 It was made in Staffordshire or Leeds, England, in the late 1700s and is hand painted with spritely polychrome floral decoration on both sides. 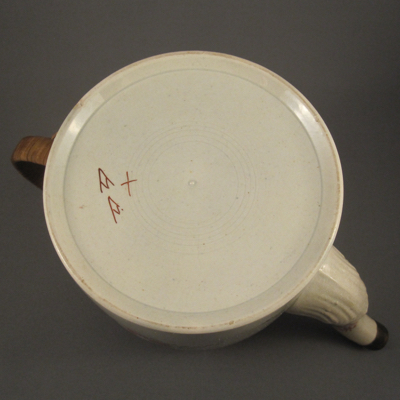 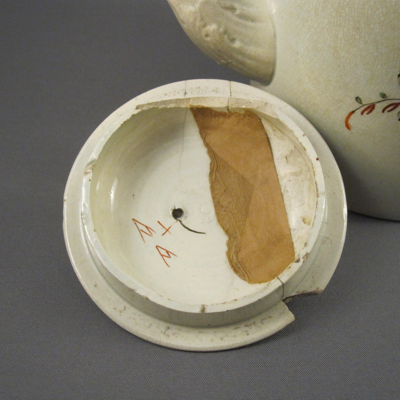 It measures 5 inches high and is marked with what appears to be A+A in red on the underside of the pot and lid. 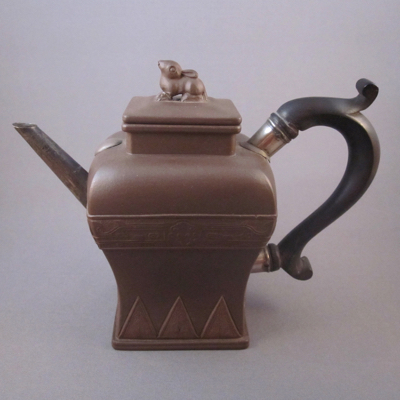 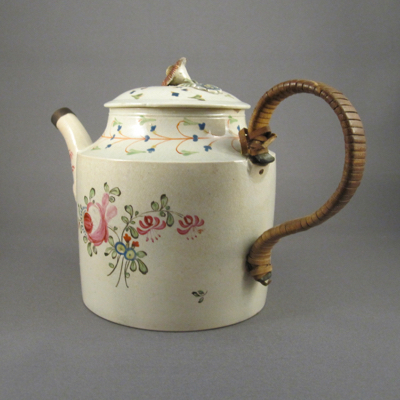 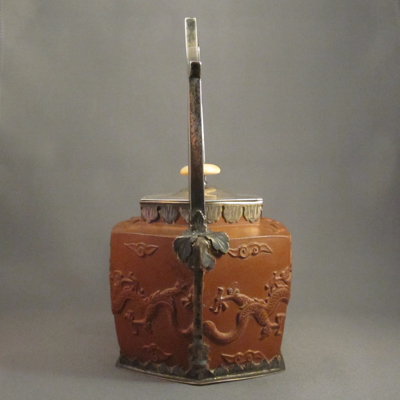 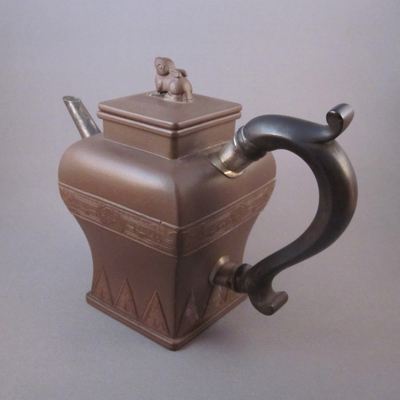 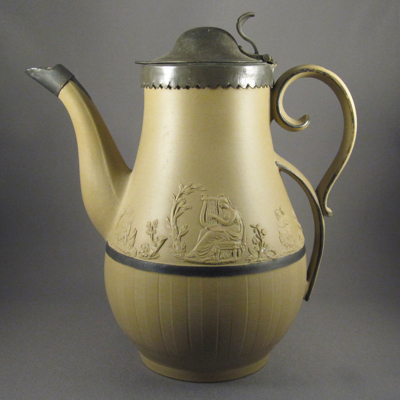 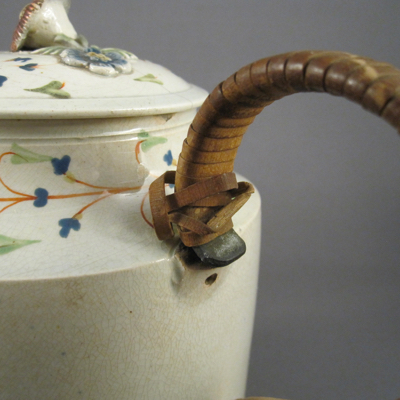 But of course the reason it ended up in my collection is the three inventive repairs, which include a slightly exaggerated bronze handle covered in rattan, a brass collar concealing a chipped spout, and a cracked lid repaired with brown paper tape. 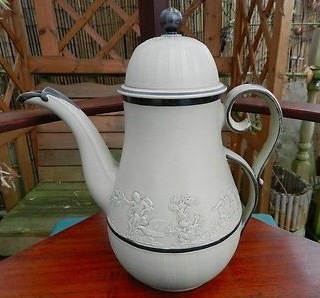 I believe each repair was done years apart so one can only assume that the previous owners of this teapot were a clumsy lot. 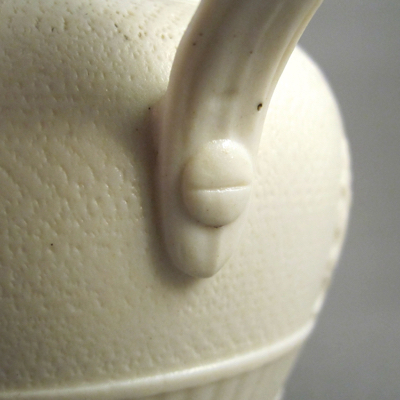 This teapot still has its original handle and spout and shows what mine may have looked like before it was repaired. 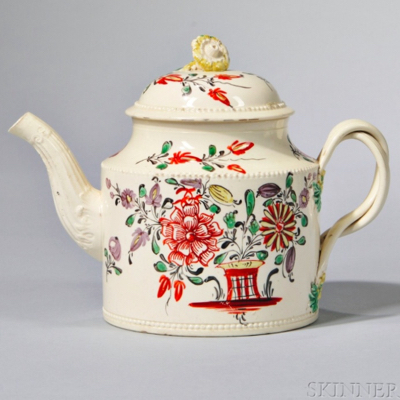 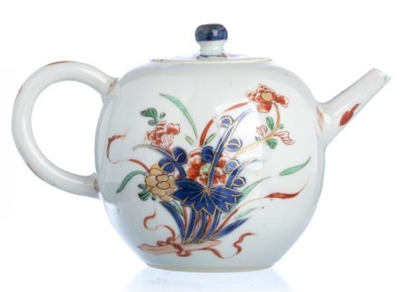 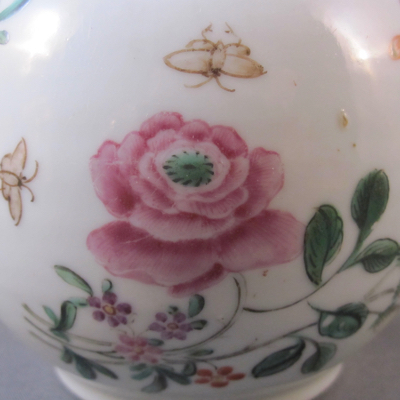 This porcelain globular-form footed teapot was made in China in the late 1700s and is decorated in the famille rose palette with flowers, butterflies, and a diaper pattern border along the rim and on the lid. 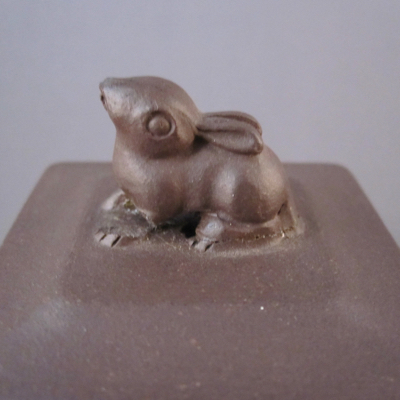 It measures 4 inches high. 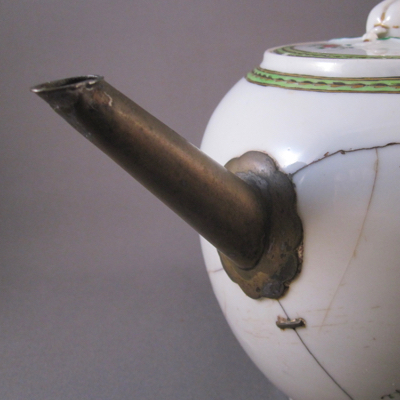 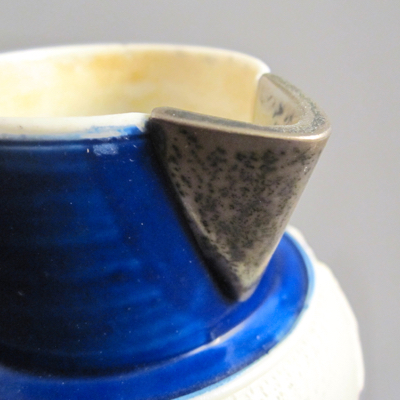 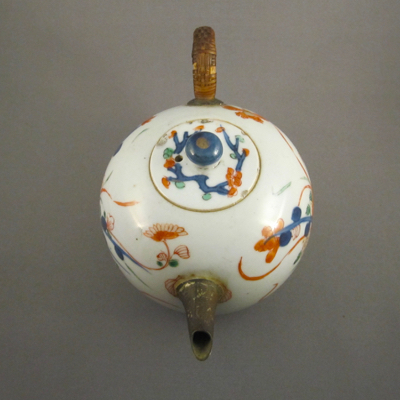 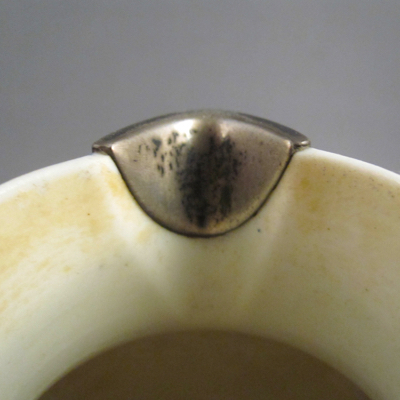 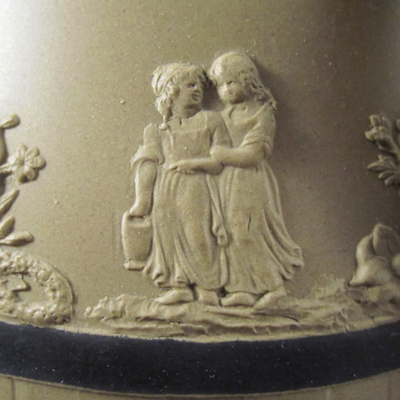 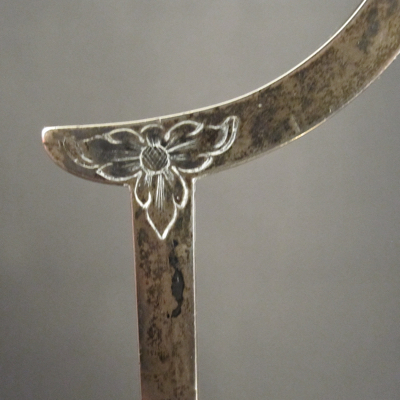 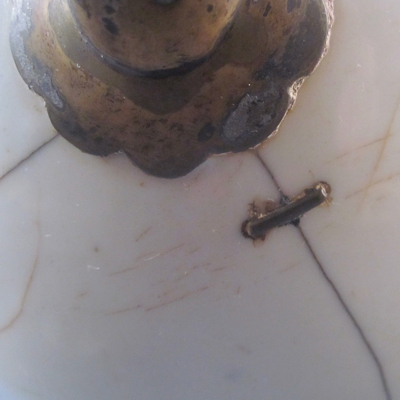 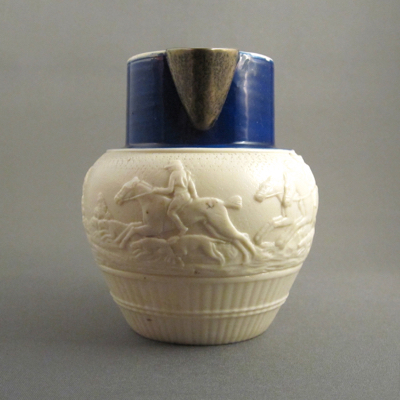 A sturdy metal spout stands at attention, replacing the original porcelain one that was damaged. 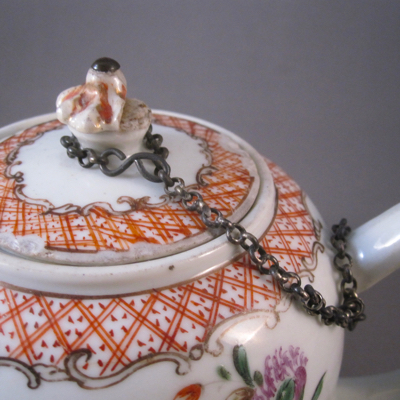 At a later date, a metal chain was attached to keep the lid from going astray. 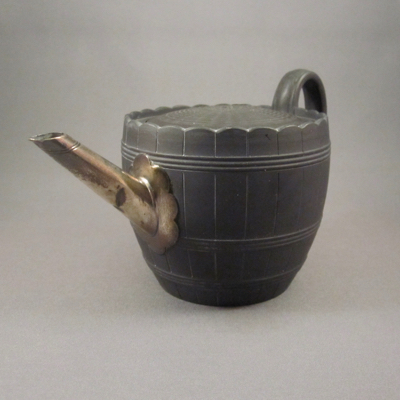 I have numerous metal replacement spouts just like this and feel that repairers had a stock of them on hand to be attached to damaged teapots. 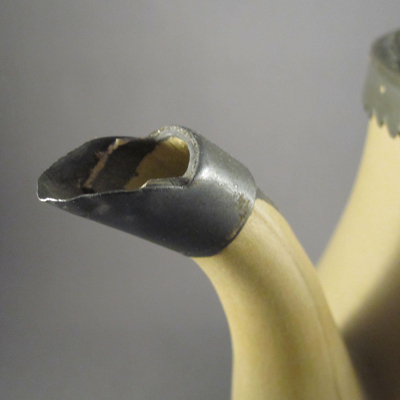 Look for an upcoming post where I compare and contrast similarly made replacement spouts. 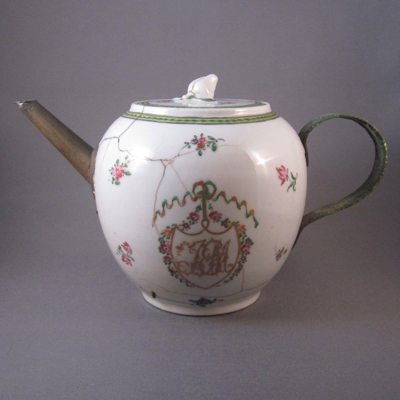 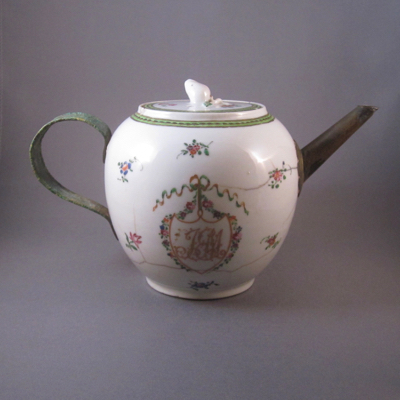 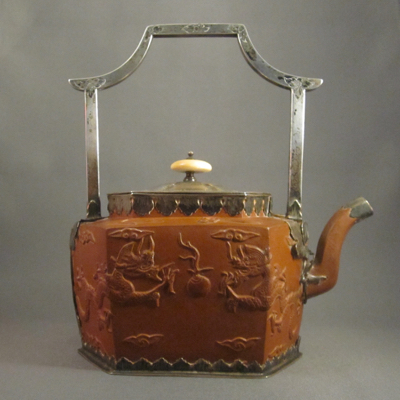 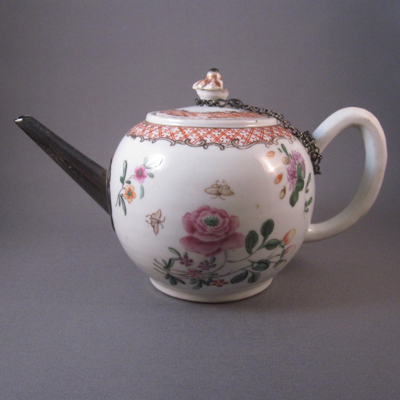 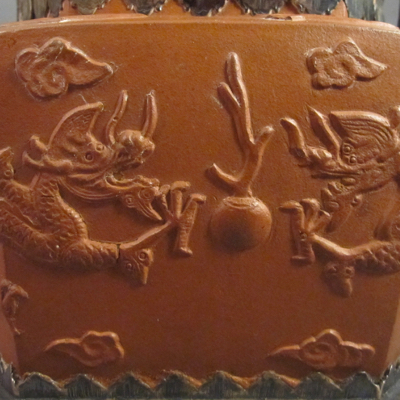 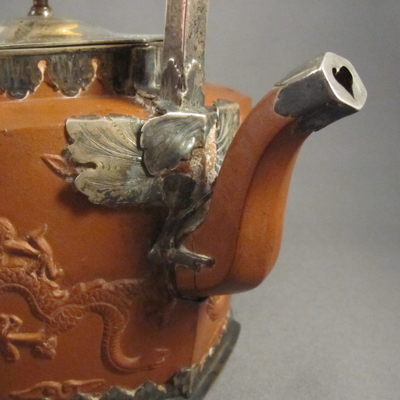 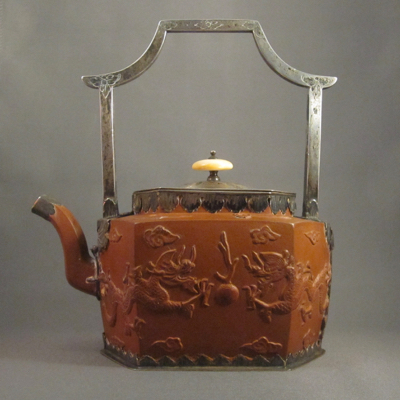 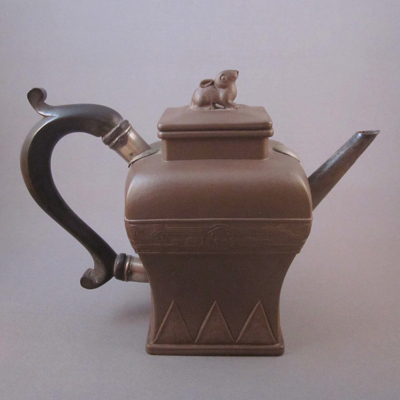 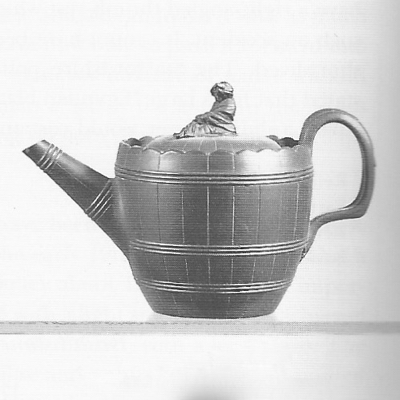 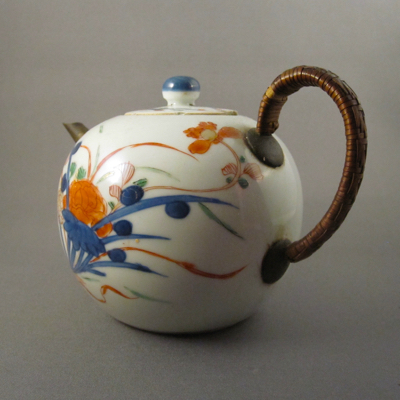 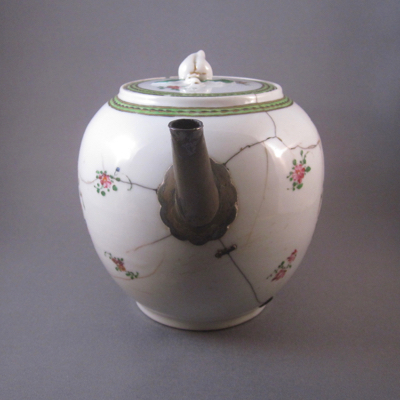 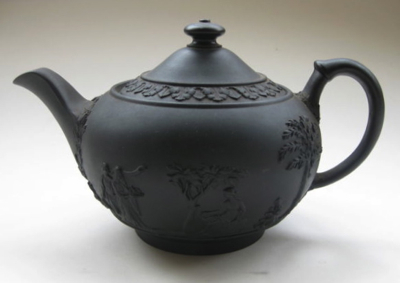 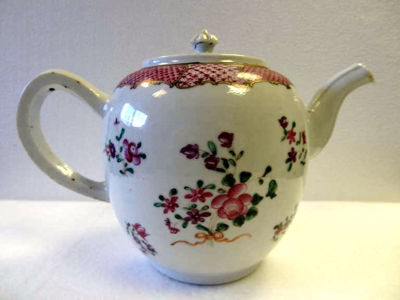 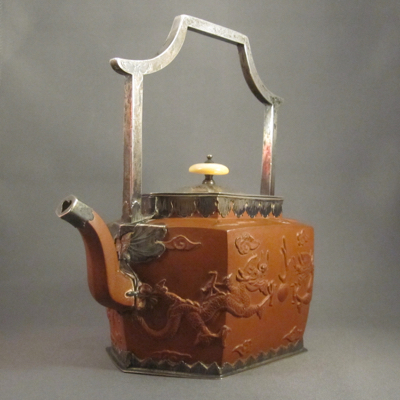 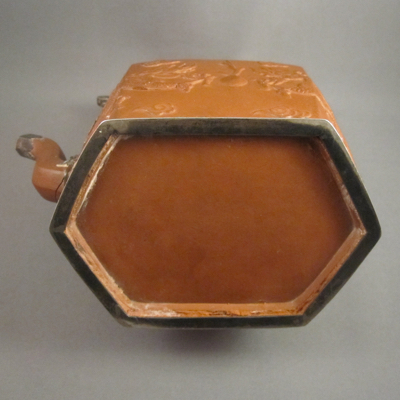 This teapot, with similar form and decoration, shows what the original spout on mine may have looked like.